The preposition dans usually means "in," but as always there are exceptions. Dans can’t be followed directly by a noun – it’s always followed by some kind of determiner, such as an article or possessive adjective. Mets les livres dans le carton. Put the books in the box. Je le garde dans le tiroir. I keep it in the drawer. Il l’a trouvé dans la rue. He found it in the street. 2) Destination – "into, for"
3) Figurative Location – "in, under"
4) Provenance – "from, out of"
5) Period of Time – "in, during"
6) Amount of Time – "in"
Je vais arriver dans une heure. I’ll be there in an hour. Nous partons dans une semaine. We’re leaving in a week. Il sera prêt dans quelques minutes. He’ll be ready in a few minutes. 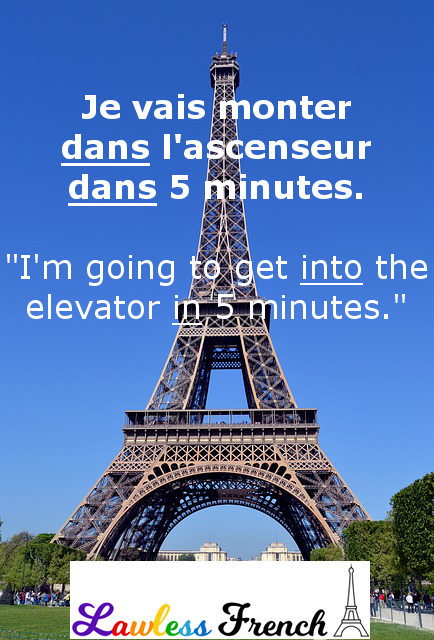 Many verbs must be followed by dans in front of a noun.